For years, many designers have added volume and curls created by heating the brushes and then leaving them to cool in the air. Working on the principle that hot air dries the hair and the cold sets the fold. However, this technique poses problems for the weight of the brush that loads on the wrist in continuous rotation necessary to give the shape to the curl, movement between the other almost impossible to try at home. The brush D- TACH combines the technology Ion Crystal with an ergonomic handle, adding a system of distribution of hot air. Through the use of magnets and friction allows the handle to detach at the appropriate time. 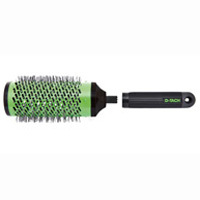 Thanks to Ion Tourmaline Crystal on the bristles is releasing, when the bristles are rubbed, negative ions. These rub the hair eliminating static charges which make them puffy and frizzy. The brushes are available in diameters of 34, 38 and 53 mm.